Veolia and Our Green Environment (OGE), a subsidiary of HMG Group, have signed a memorandum of understanding (MoU) to build, own and operate a hazardous waste landfill, recycling and incineration plant in Jubail Industrial City. The agreement, which includes industrial and medical waste collection and treatment services, will reach a total investment of US$100 million. OGE has already obtained the preliminary licences to develop the facilities and construction is expected to start by the first quarter of 2017. Lietuvos Energija has awarded contracts to a consortium consisting of Steinmuller Babcock Environment, Budimex and UAB Kauno dujotiekio statyba, with a value of €178.29 million, for a waste incineration plant. Rafako has also been awarded a contract for a biomass combustion plant and biofuel supply infrastructure valued at €149.65 million. The cogeneration plants will comprise 18 MW of electric power and around 53 MW of thermal power (waste-fired), and around 70 MW of electric power and 174 MW of thermal power (biofuel-fired). To find out more on how this project is progressing, click here. In the week ended 22nd July 2016, AcuComm added 41 new or updated waste projects to our Business db, worth an estimated US$2,776 million and waste capacity of just over 9.2 million tonnes. This takes the total estimated investment value of projects to US$324.9 billion. Wood or wood-based products were the leading feedstock type reported on in the past week, accounting for 3.7 million tonnes, or 39.7% of the total. The leading countries in the past week were the USA with eight and France with four. For more information on this or any of out other packages, book a demo today. On 7th July 2016, Averda reported that it has opened a R 250 million hazardous waste management plant and the first new hazardous waste landfill site in South Africa in 20 years in Vlakfontein, in Vaal Triangle. For more information on the opening, click here. The Universidad Nacional Autónoma de México (UNAM) has inaugurated a pilot plant that is able to process organic municipal solid waste (MSW) to produce biogas. Researchers from the facilities of Chemistry and Engineering and the Institute of Engineering at UNAM have adapted technology, which is already used elsewhere in the world, to conditions in Mexico in order to be able to build and operate plants at the municipal level. Alfonso Durán Moreno, co-ordinator of the project, noted that this is the only plant in Mexico that can treat MSW using both wet and dry anaerobic digestion technology. To find out more details on this new plant, click here. 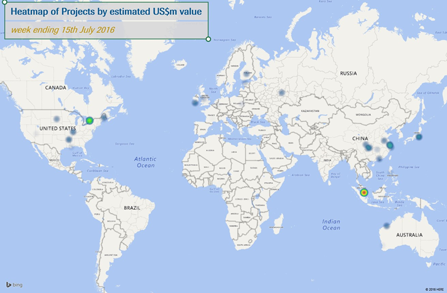 In the week ended 15th July 2016, AcuComm added 43 new or updated waste projects to our Business db, worth an estimated US$7,205 million and waste capacity of just over 13.8 million tonnes. This takes the total estimated investment value of projects to US$325.5 billion. WtE incineration was the largest category in terms of waste capacity in the past week, accounting for just over 7.7 million tonnes. The leading countries in the past week were the USA and China with eight projects each. As part of AcuComm’s Search Analytics, your organisation can gain access to each of these new projects and the thousands of others we currently have in our database. Simply tick the criteria you wish to search for and instantly generate a list of projects that have been analysed across four key metrics – value, capacity, output and expected completion date. To put our database to the test, click here. In July 2016, a spokesperson for Delhi MSW Solutions advised AcuComm that a 24 MW waste-to-energy (WtE) project on a 150-acre site at Narela Bawana in Delhi commenced trial runs in June. The project is being undertaken by Delhi MSW Solutions, a subsidiary of Ramky Enviro Engineers, on a 20-year build-operate-transfer basis. The project is valued at Rs 4 billion. The plant treats 1,200 tonnes per day (tpd) of municipal solid waste and will produce 450 tpd of refuse-derived fuel. Dubai Municipality (DM) is establishing the largest plant in the Middle East to convert municipal solid waste (MSW) into energy at a cost of AED 2 billion. The plant will be located in Warsan 2 district next to the existing landfill. On 21st June 2016, DM issued a tender to ten qualified companies for an engineering, procurement and construction contract to develop a waste-to-energy project with a capacity of not less than 2,000 tonnes of MSW per day. In this first phase the plant will produce 60 MW. The qualified company will be selected in April 2017. SSE has taken a final investment decision to proceed with the £360 million Ferrybridge Multifuel 2 (FM2) project, with construction expected to begin later in the year. An engineering, procurement, construction (EPC) contract has also been signed with Hitachi Zosen Inova which was also the main EPC contractor on the FM1 plant. The FM2 project will have the capacity to process up to 675,000 tonnes of waste-derived fuels each year to produce around 70 MW of electricity. In the week ended 8th July 2016, AcuComm added 45 new or updated waste projects to our Business db, worth an estimated US$4,658 million and waste capacity of just under 10.9 million tonnes. This takes the total estimated investment value of projects to US$319.8 billion. The average active waste project is worth US$76 million. There are naturally wide variations in average project value, due to the size, duration and complexity of different types of project. Municipal Solid Waste (MSW) was the leading feedstock type reported on in the past week, accounting for an estimated 6.0 million tonnes, or 55.5% of the total. AcuComm’s Business db provides unique and unrivalled coverage of all major waste, bioenergy and recycling projects from across the globe, including complete details on contacts, location, size and more. Real-time updates also allow you to be the first to know if something changes on a project you’re targeting, meaning you don’t miss out! To find out how this coverage could benefit your organisation, book a demo today. The Japanese waste treatment sector has a very distinctive character. Much of the country is densely-populated and land is at a premium. The most popular method for treatment/disposal therefore is incineration, which has the added benefit of generating power for the country’s population of over 127 million. 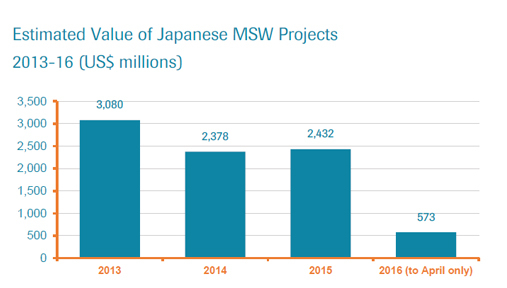 AcuComm has identified 79 separate projects for the treatment or disposal of waste across Japan, with a combined investment value of US$8.5 billion or US$107 each on average. Around 67% of projects involve incineration with energy recovery. These have a total annual waste capacity of around 7.1 million tonnes, equal to around 400 tonnes per day on average. These projects – when all are operational – will generate around 1,086 MW of electricity. Investment opportunities occur across Japan, but projects are concentrated in and around the two major urban areas of greater Tokyo and Osaka. Both are on the main island of Honshu. The market is currently dominated by Japanese companies such as Hitachi Zosen, Mitsubishi and Takuma. 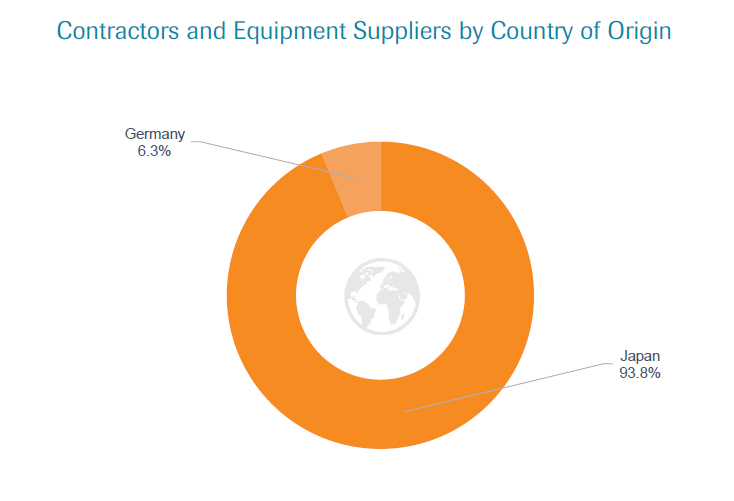 However, overseas suppliers have made inroads into the market, such as the German waste plant equipment supplier, Martin GmbH. The European Bank for Reconstruction and Development (EBRD) is considering providing up to US$15 million debt finance to Green Oil and Lubes to help fund the construction of a US$56 million used lubricating oil recycling plant, with an expected recycling capacity of 73,000 tonnes per year. The project will be the first of this type in Romania and in the CEE region, where demand has so far been covered through imports. On 23rd June 2016, work started on the construction of a new £140 million biomass combined heat and power (CHP) plant at Discovery Park, based in Sandwich, Kent. Burmeister & Wain Scandinavian Contractor (BWSC) has taken possession of the development site, marking the start of a project that will take around two years to complete. The facility will use conventional CHP steam turbine technology to generate approximately 11-15 MW of power and 8-12 MW of heat, which would be enough energy to supply the equivalent of 21,000 homes with electricity. The biomass plant will use locally sourced low-grade wood fuel from local forestry and woodland. The US Trade and Development Agency (USTDA) has awarded a grant to MBHE African Power (Pty) Ltd to support a waste-to-energy (WtE) project in the Drakenstein Municipality. The project has the potential to divert up to 500 tons of municipal solid waste per day from the landfill to the plant, which is expected to produce around 12.6 MW of electricity. According to Lida Fitts, the USTDA’s Regional Director for Sub-Saharan Africa, the project is anticipated to be South Africa’s first WtE plant. In the week ended 1st July 2016, AcuComm added 39 new or updated waste projects to our Business db, worth an estimated US$5,340 million and waste capacity of just over 9.8 million tonnes. This takes the total estimated investment value of projects to US$318.5 billion. The total estimated power generation from these projects was 1,188 MW. 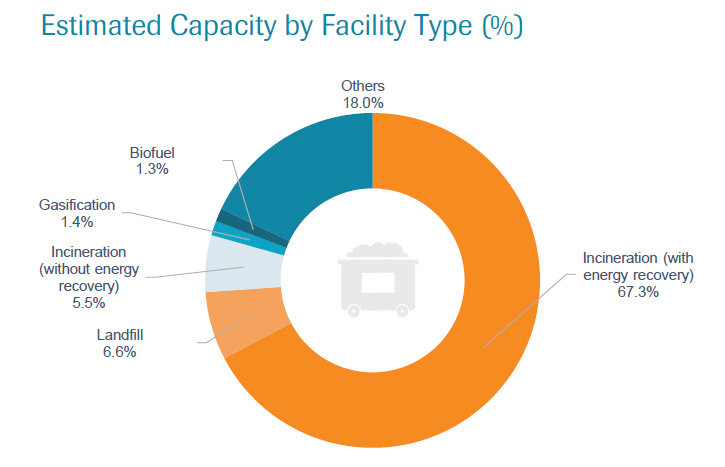 WtE incineration was the largest category, accounting for 848 MW. The leading countries in the past week were the USA with 11 projects and the UK with seven.